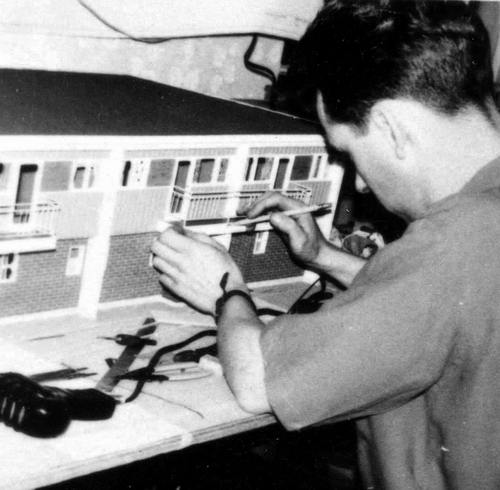 Before launching my "Brinkworth Models to Scale" business, my Brother and I operated "Brinkworth Brothers", a Painting and Wallpapering business in Vancouver. Painting a kitchen, and hanging wallpaper for the owner of the The Building Center BC - Mr. Charlie Thorne. 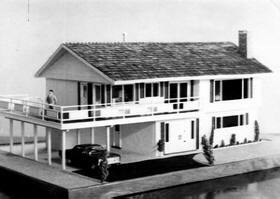 The Building Center was a house plan service on Kingsway, and Charlie gave me my first Architectural Model commission. 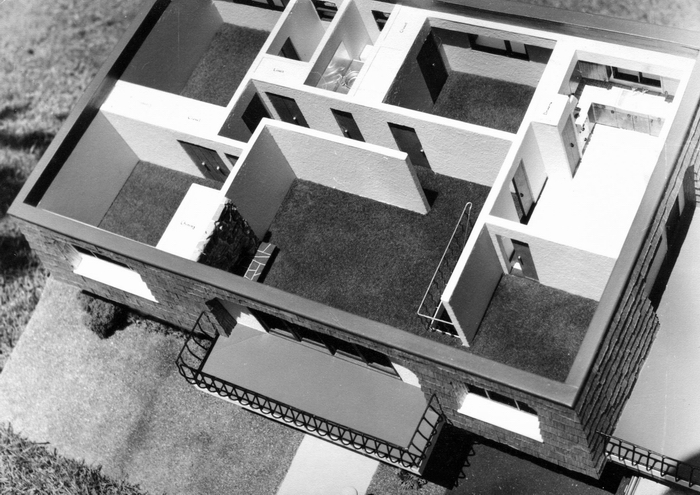 A "demonstration model" built from a set of his house plans, to display in his Broadway showrooms, to promote plan sales. The model below, was the first of a two year long, permanent commission, to build as many different models as I could, for his showroom. I'm not too sure exactly how many models we built for him but it certainly kept my wife and I busy for a long time. 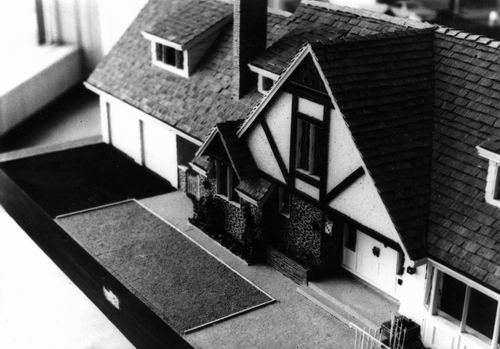 It was also responsible for launching my model business in Vancouver, as the Building Center was very well known, and a landmark that everyone knew very well. Charlie and his wife, became good family friends, for the many years that followed. 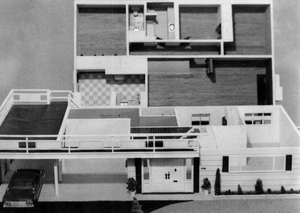 Roof could be removed showing the upper floor plan, and upper floor was also removable, to display the lower level of the home. Women in particular I remember, were very excited to see their future home in three dimension, before deciding on a particular floor plan to build. 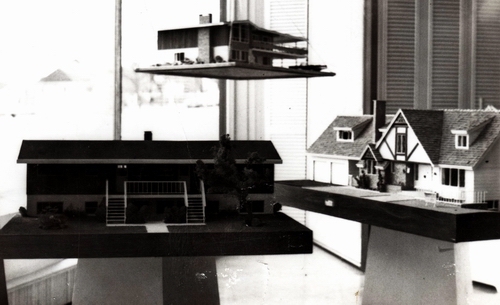 Above: A few of the very early models on display in the Broadway showroom of the Building Center. 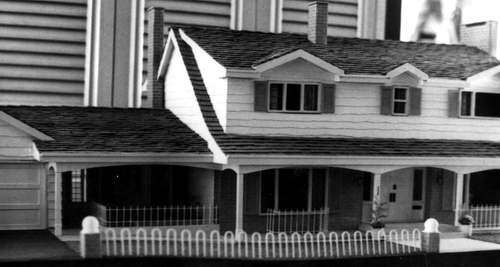 Almost all their models were built in a scale of 1/2"= 1 foot. 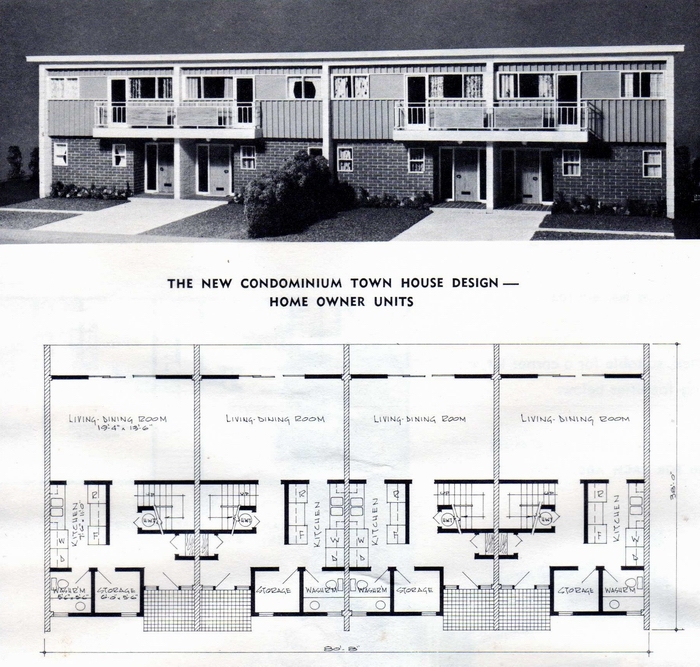 Working on the condo model, shown on the left, and showing how it appeared in the Building Center BC catalogue of plans available. The model above: has unforgettable memories for my wife Elza and I. 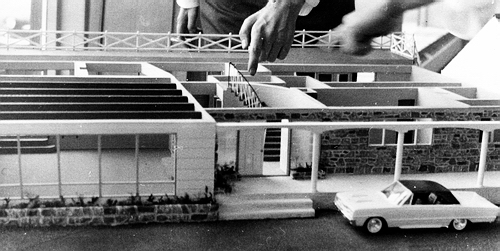 On the day the model was being completed, one of the last tasks to be done was Tar and Gravel the roof. This entailed covering the complete roof area with white glue, and sprinkling a black gravel compound over it to create the desired effect. This job done, it was left to dry over night, for delivery to the client the following day. Our young Son Barry, woke early the following morning, and thought he would help his Dad, by smearing the roof... again... with white glue. That task done "really well", he thought he would share some of his chocolate bar with the miniature "white dog", seen on the front lawn of the model home. 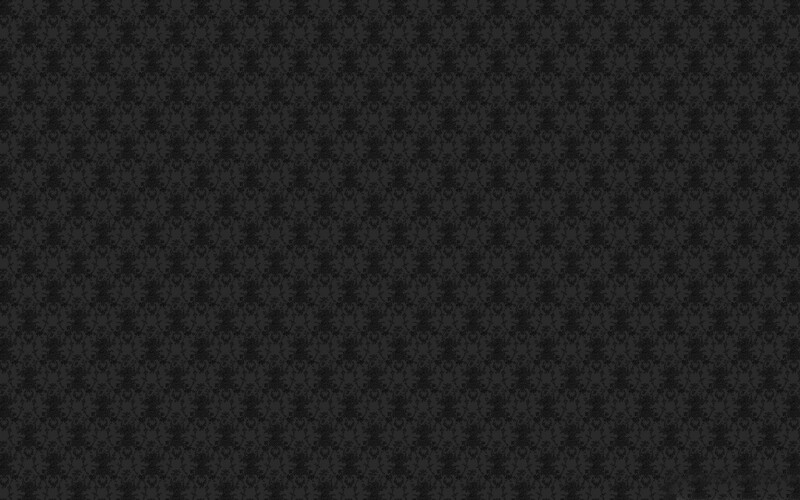 It was difficult to know how to react, considering his good intentions. 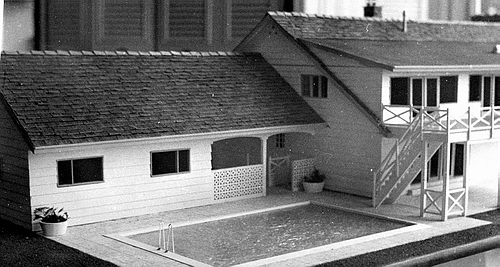 Needless to say, ...... the model was not delivered that day to the client as planned.